In all honesty, I probably would not have gone to Madrid, apart from a business trip. I expected it to be a big, commercial business city. But how was I wrong. As a surprise trip, arranged by srprs.me, my wife and I ended up in the city in September 2018 and we enjoyed every bit of it. So, without any further ado, here are our best tips for Madrid. Sure, Madrid has its nice museums, beautiful buildings, and tourist attractions. But on first sight, it might seem there is way less to see compared to other major cities in Europe. The key charm for us in Madrid was mainly in how liveable the city seems to be as a tourist and how easy it is to adapt to the local’s pace. There are plenty of great parks where you can spend the day, there are plenty of quarters/areas in the city where you can spend the day strolling and the city is well adapted to people loving great food (and don’t we all). Buses, metro, bikes and your feet take you everywhere rather fast. The Japanese habit of omakase (お任せ) when you’re ordering at a restaurant pretty much means, “I’ll leave it up to you”, inviting the chef to be innovative and surprising in the selection of dishes. 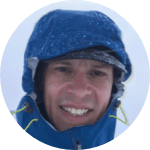 I try to do it in every city I visit, and apply the idea behind to everything between how I pick my runs, how I pick my food, how I plan activities with my kids, how I explore cities and how I travel in general. So, I tried this in Amsterdam as well. My best omakase experience in Madrid was in restaurant Fismuler (more on that below), where I had an amazing surprise lunch. That is definitely one of my best tips for Madrid. The Radio rooftop bar on top of the ME Madrid Reina Victoria by Melia hotel is not the cheapest place to get your drinks, but it is worth every penny. A breathtaking view over the city is combined with a relaxed atmosphere and a skilled staff that makes cocktails to perfection – surely one of the best places in Madrid to go out for a drink. Mercado San Anton is a large food market, great for grocery shopping and some quick bites. It also has a rooftop bar (3rd floor) as well, which is a very nice place to get some drinks. El Corte Ingles at Calle del Carmen (Calle del Carmen 4) has a really really nice foodcourt and terrace on the 9th floor with a great view over the city center. TOMA is a really nice coffee bar in the Malasana area of the city. Make sure to get a coffee to stay or to go, when you’re browsing the local streets for some vintage stuff. The squares. Pretty much every one of them. Much of life happens in the street and the squares. We did not love Plaza Mayor too much (pricey, too many tourists, annoying artists), but pretty much every other was great (Plaza de Santa Ana, Plaza Juan Puyol, …). Fismuler. If there’s one place you go to have lunch or dinner in Madrid, go Fismular. Great quality food, home-made gins that are finished on a cart at your table and great staff. Mercado San Miguel is a rather commercial but very appealing food market with a lot of great bites and wines. Although the wines are very reasonably priced, the bites can sometimes be a bit pricey. But the atmosphere (and quality) is usually worth it. Museo de Jamon is a must-visit place when you’re in Madrid. Get a place at the bar, have a beer and enjoy some local ham to snack. Bar Tomate is located in the embassy district in Madrid (which shows by the regular business meetings taking place) and has some amazing food. Really try the avocado tacos with tuna. Churros obviously. There are plenty of places to eat churros, but the most famous one is San Gines. El Corte Ingles at Calle del Carmen (Calle del Carmen 4) has a really really nice food court (definitely try the pizza) and terrace on the 9th floor with a great view over the city center. 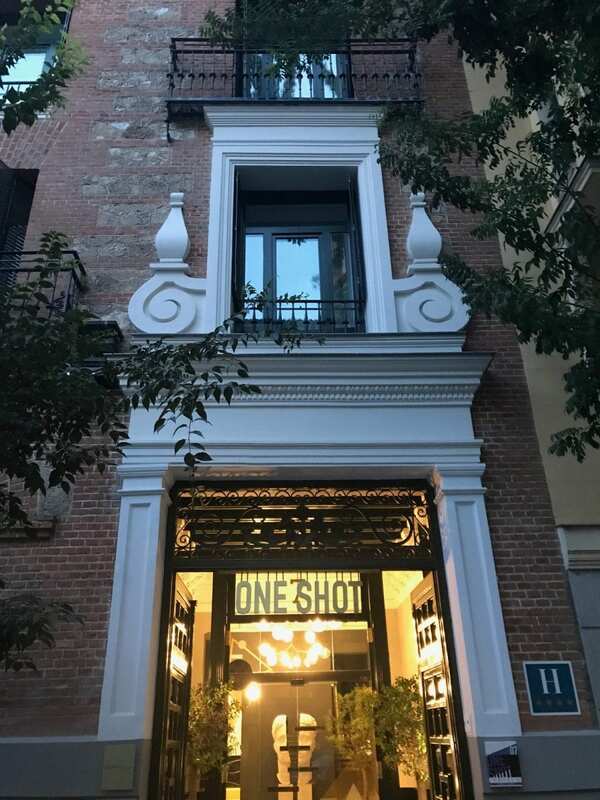 One shot is a hotel chain with design and boutique hotels in Spain (and several in Madrid). 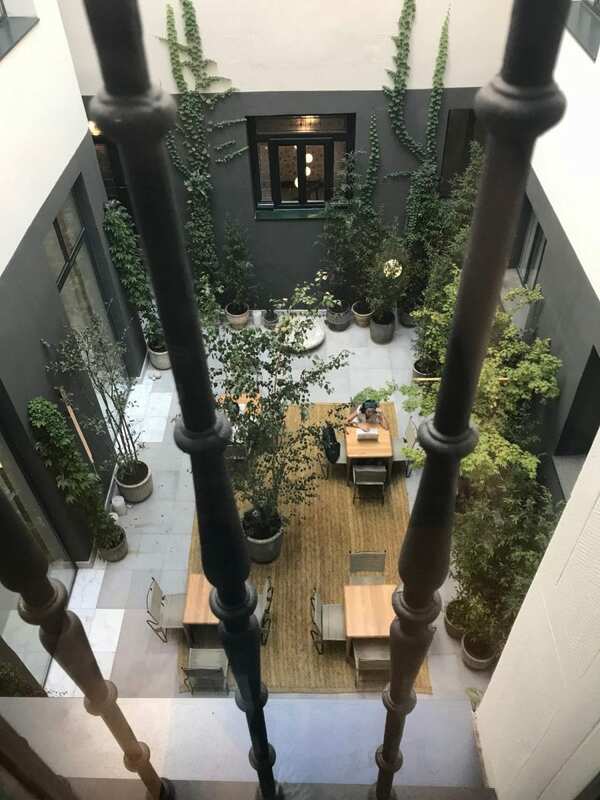 We stayed in the One Shot Fortuny hotel (see my separate review), which was a really really nice base for our Madrid trip. A beautiful old building, really nice atmosphere, great patio, super breakfast, and amazingly friendly staff, ranging from their cleaning team to the people at the reception and the different managers. ME Madrid Reina Victoria by Melia is a beautiful majestic hotel right in the city center. If you can find a sweet deal here (rooms are rather pricey), do not hesitate. Apart from the super stylish rooms, the hotel has an amazing rooftop bar (Radio, see above) and a spa. One of my favorite IHG hotel chains, Indigo (also see my review of the Antwerp Indigo Hotel), has an Indigo hotel in the city center. We quickly visited the hotel to get some work done and to enjoy the view over the city, but could not shake the feeling the hotel isn’t living up to Indigo standard. Although the view is indeed amazing, the rooftop infinity swimming pool is more of a large bath than a true swimming pool (photos on the website are taken from the best possible corner) and the rooftop bar could definitely be better. Same goes for overall styling and service. Malasana is an area with a lot of small (vintage) shops and galleries (and by now, more and more co-working spaces). Make sure to get lost in the small streets (turn left when you know you have to go right), get some coffee at TOMA, get lunch or drinks at the Ojala bar. Chueca has become the gay district of Madrid in recent decades and is a vibrant areas full of bars, nice small shops and food markets. Hammam Al Ándaluz – there is a really nice hammam right in the city center. Be sure to reserve beforehand, as the hammam is rather small/intimate and especially the massages fill up quickly. Parks – there are a lot of large green areas in Madrid and just outside of the city. Parque de El Retiro with its lake and nearby botanical garden, Park Madrid Rio with it’s galleries and skate park, etc etc. The One shot hotels throughout the city are open for breakfast and brunch and offer great coffee and even better breakfast. Depending on the hotel, for about 14 euros you’ll have unlimited coffee, fruit and your daily dose of acai bowl and avocado sandwich (yes, guilty as charged). Indigo Hotel Madrid has a rooftop bar which is relatively quiet, especially in the mornings. Get a coffee while enjoying the view over the city and the green areas just outside of the city. In the Malasana area are quite some co-working spaces. Although rules and access vary from co-working space to co-working space, it is quite easy to arrange a wifi/coffee-enables spot to get some work done right in the city center.